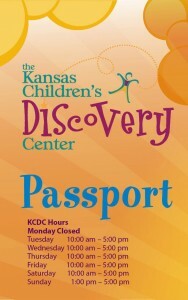 Customers can check out a passport to visit the Kansas Children’s Discovery Center, a fun, hands-on children’s attraction with emphasis on science, technology, engineering, art and math. The library has eight total passports available. Passports are available on a first-come, first-served basis. Come to the library to pick up a passport at the Youth Services desk in the Kids Library. Check out the passport at the checkout kiosk. It is good for 2 adults and up to 5 children. Passes can only be checked out by an adult 18 years of age or older and with a library account in good standing. Passes are good for a one-time use, however, it checks out for 7 days so you can plan your visit within that time. Adults must be accompanied by a child 18 years of age or under. Please present the pass upon arrival at KCDC. Staff at KCDC will keep the pass, which will be returned promptly to the library. If you have not used or returned your passport within 30 days, your account will be charged a $5 non-refundable fee. Did you know that customers can check out a passport to visit the World Famous Topeka Zoo? The passport is good for 2 adults and up to 4 children.